Proprietary Name: Flurbiprofen What is the Proprietary Name? Non-Proprietary Name: Flurbiprofen What is the Non-Proprietary Name? Flurbiprofen with NDC 68788-7341 is a a human prescription drug product labeled by Preferred Pharmaceuticals Inc.. The generic name of Flurbiprofen is flurbiprofen. The product's dosage form is tablet, film coated and is administered via oral form. FDA Application Number: ANDA074431 What is the FDA Application Number? Cardiovascular Thrombotic Events •Nonsteroidal anti-inflammatory drugs (NSAIDs) cause an increased risk of serious cardiovascular thrombotic events, including myocardial infarction and stroke, which can be fatal. This risk may occur early in treatment and may increase with duration of use [see Warnings and Precautions (5.1)]. •Flurbiprofen tablets are contraindicated in the setting of coronary artery bypass graft (CABG) surgery [see Contraindications (4) and Warnings and Precautions (5.1)]. Gastrointestinal Bleeding, Ulceration, and Perforation •NSAIDs cause an increased risk of serious gastrointestinal (GI) adverse events including bleeding, ulceration, and perforation of the stomach or intestines, which can be fatal. These events can occur at any time during use and without warning symptoms. Elderly patients and patients with a prior history of peptic ulcer disease and/or GI bleeding are at greater risk for serious GI events [see Warnings and Precautions (5.2)]. Flurbiprofen tablets are indicated: •For relief of the signs and symptoms of rheumatoid arthritis. •For relief of the signs and symptoms of osteoarthritis. Carefully consider the potential benefits and risks of flurbiprofen tablets and other treatment options before deciding to use flurbiprofen tablets. Use the lowest effective dosage for the shortest duration consistent with individual patient treatment goals [see Warnings and Precautions (5)].After observing the response to initial therapy with flurbiprofen tablets, the dose and frequency should be adjusted to suit an individual patient's needs.For relief of the signs and symptoms of rheumatoid arthritis or osteoarthritis, the dosage is 200 to 300 mg per day, divided for administration two, three, or four times a day. The largest recommended single dose in a multiple-dose daily regimen is 100 mg.
Flurbiprofen tablets are contraindicated in the following patients: •Known hypersensitivity (e.g., anaphylactic reactions and serious skin reactions) to flurbiprofen or any components of the drug product [see Warnings and Precautions (5.7, 5.9)] •History of asthma, urticaria, or other allergic-type reactions after taking aspirin or other NSAIDs. Severe, sometimes fatal, anaphylactic reactions to nonsteroidal anti-inflammatory drugs have been reported in such patients [see Warnings and Precautions (5.7, 5.8)]. •In the setting of coronary artery bypass graft (CABG) surgery [see Warnings and Precautions (5.1)]. Clinical trials of several COX-2 selective and nonselective NSAIDs of up to three years duration have shown an increased risk of serious cardiovascular (CV) thrombotic events, including myocardial infarction (MI), and stroke, which can be fatal. Based on available data, it is unclear that the risk for CV thrombotic events is similar for all NSAIDs. The relative increase in serious CV thrombotic events over baseline conferred by NSAID use appears to be similar in those with and without known CV disease or risk factors for CV disease. However, patients with known CV disease or risk factors had a higher absolute incidence of excess serious CV thrombotic events, due to their increased baseline rate. Some observational studies found that this increased risk of serious CV thrombotic events began as early as the first weeks of treatment. The increase in CV thrombotic risk has been observed most consistently at higher doses. To minimize the potential risk for an adverse CV event in NSAID-treated patients, use the lowest effective dose for the shortest duration possible. Physicians and patients should remain alert for the development of such events, throughout the entire treatment course, even in the absence of previous CV symptoms. Patients should be informed about the symptoms of serious CV events and the steps to take if they occur. There is no consistent evidence that concurrent use of aspirin mitigates the increased risk of serious CV thrombotic events associated with NSAID use. The concurrent use of aspirin and an NSAID, such as flurbiprofen, increases the risk of serious gastrointestinal (GI) events [see Warnings and Precautions (5.2)]. Status Post Coronary Artery Bypass Graft (CABG) SurgeryTwo large, controlled clinical trials of a COX-2 selective NSAID for the treatment of pain in the first 10 to 14 days following CABG surgery found an increased incidence of myocardial infarction and stroke. NSAIDs are contraindicated in the setting of CABG [see Contraindications (4)]. Post-MI PatientsObservational studies conducted in the Danish National Registry have demonstrated that patients treated with NSAIDs in the post-MI period were at increased risk of reinfarction, CV-related death, and all-cause mortality beginning in the first week of treatment. In this same cohort, the incidence of death in the first year post-MI was 20 per 100 person years in NSAID-treated patients compared to 12 per 100 person years in non-NSAID exposed patients. Although the absolute rate of death declined somewhat after the first year post-MI, the increased relative risk of death in NSAID users persisted over at least the next four years of follow-up.Avoid the use of flurbiprofen in patients with a recent MI unless the benefits are expected to outweigh the risk of recurrent CV thrombotic events. If flurbiprofen is used in patients with a recent MI, monitor patients for signs of cardiac ischemia. NSAIDs, including flurbiprofen, cause serious gastrointestinal (GI) adverse events including inflammation, bleeding, ulceration, and perforation of the esophagus, stomach, small intestine, or large intestine, which can be fatal. These serious adverse events can occur at any time, with or without warning symptoms, in patients treated with NSAIDs. Only one in five patients, who develop a serious upper GI adverse event on NSAID therapy, is symptomatic. Upper GI ulcers, gross bleeding, or perforation caused by NSAIDs occur in approximately 1% of patients treated for 3 to 6 months, and in about 2% to 4% of patients treated for one year. However, even short-term therapy is not without risk. Risk Factors for GI Bleeding, Ulceration, and Perforation Patients with a prior history of peptic ulcer disease and/or GI bleeding who used NSAIDs had a greater than 10-times increased risk for developing a GI bleed compared to patients without these risk factors. Other factors that increase the risk of GI bleeding in patients treated with NSAIDs include longer duration of NSAID therapy; concomitant use of oral corticosteroids, aspirin, anticoagulants, or selective serotonin reuptake inhibitors (SSRIs); smoking, use of alcohol, older age, and poor general health status. Most postmarketing reports of fatal GI events occurred in elderly or debilitated patients. Additionally, patients with advanced liver disease and/or coagulopathy are at increased risk for GI bleeding. Strategies to Minimize the GI Risks in NSAID-treated patients: •Use the lowest effective dosage for the shortest possible duration. •Avoid administration of more than one NSAID at a time. •Avoid use in patients at higher risk unless benefits are expected to outweigh the increased risk of bleeding. For such patients, as well as those with active GI bleeding, consider alternate therapies other than NSAIDs. •Remain alert for signs and symptoms of GI ulceration and bleeding during NSAID therapy. •If a serious GI adverse event is suspected, promptly initiate evaluation and treatment, and discontinue flurbiprofen until a serious GI adverse event is ruled out. •In the setting of concomitant use of low-dose aspirin for cardiac prophylaxis, monitor patients more closely for evidence of GI bleeding [see Drug Interactions (7)]. Elevations of ALT or AST (three or more times the upper limit of normal [ULN]) have been reported in approximately 1% of NSAID-treated patients in clinical trials. In addition, rare, sometimes fatal, cases of severe hepatic injury, including fulminant hepatitis, liver necrosis, and hepatic failure have been reported. Elevations of ALT or AST (less than three times ULN) may occur in up to 15% of patients treated with NSAIDs including flurbiprofen.Inform patients of the warning signs and symptoms of hepatotoxicity (e.g., nausea, fatigue, lethargy, diarrhea, pruritus, jaundice, right upper quadrant tenderness, and "flu-like" symptoms). If clinical signs and symptoms consistent with liver disease develop, or if systemic manifestations occur (e.g., eosinophilia, rash, etc. ), discontinue flurbiprofen immediately, and perform a clinical evaluation of the patient. NSAIDs, including flurbiprofen, can lead to new onset of hypertension or worsening of preexisting hypertension, either of which may contribute to the increased incidence of CV events. Patients taking angiotensin converting enzyme (ACE) inhibitors, thiazide diuretics, or loop diuretics may have impaired response to these therapies when taking NSAIDs [see Drug Interactions (5.1, 7)]. Monitor blood pressure (BP) during the initiation of NSAID treatment and throughout the course of therapy. The Coxib and traditional NSAID Trialists’ Collaboration meta-analysis of randomized controlled trials demonstrated an approximately two-fold increase in hospitalizations for heart failure in COX-2 selective-treated patients and nonselective NSAID-treated patients compared to placebo-treated patients. In a Danish National Registry study of patients with heart failure, NSAID use increased the risk of MI, hospitalization for heart failure, and death. Additionally, fluid retention and edema have been observed in some patients treated with NSAIDs. Use of flurbiprofen may blunt the CV effects of several therapeutic agents used to treat these medical conditions (e.g., diuretics, ACE inhibitors, or angiotensin receptor blockers [ARBs]) [see Drug Interactions (7)]. Avoid the use of flurbiprofen in patients with severe heart failure unless the benefits are expected to outweigh the risk of worsening heart failure. If flurbiprofen is used in patients with severe heart failure, monitor patients for signs of worsening heart failure. Renal ToxicityLong-term administration of NSAIDs has resulted in renal papillary necrosis and other renal injury. Renal toxicity has also been seen in patients in whom renal prostaglandins have a compensatory role in the maintenance of renal perfusion. In these patients, administration of an NSAID may cause a dose-dependent reduction in prostaglandin formation and, secondarily, in renal blood flow, which may precipitate overt renal decompensation. Patients at greatest risk of this reaction are those with impaired renal function, dehydration, hypovolemia, heart failure, liver dysfunction, those taking diuretics and ACE inhibitors or ARBs, and the elderly. Discontinuation of NSAID therapy is usually followed by recovery to the pretreatment state. In clinical studies, the elimination half-life of flurbiprofen was unchanged in patients with renal impairment. Flurbiprofen metabolites are eliminated primarily by the kidneys. Elimination of 4’hydroxy-flurbiprofen was reduced in patients with moderate to severe renal impairment. Therefore, treatment with flurbiprofen is not recommended in these patients with advanced renal disease. If flurbiprofen therapy must be initiated, close monitoring of the patients renal function is advisable [see Clinical Pharmacology (12)]. Correct volume status in dehydrated or hypovolemic patients prior to initiating flurbiprofen. Monitor renal function in patients with renal or hepatic impairment, heart failure, dehydration, or hypovolemia during use of flurbiprofen [see Drug Interactions (7)]. Avoid the use of flurbiprofen in patients with advanced renal disease unless the benefits are expected to outweigh the risk of worsening renal function. If flurbiprofen is used in patients with advanced renal disease, monitor patients for signs of worsening renal function. Hyperkalemia Increases in serum potassium concentration, including hyperkalemia, have been reported with use of NSAIDs even in some patients without renal impairment. In patients with normal renal function, these effects have been attributed to a hyporeninemic-hypoaldosteronism state. Flurbiprofen has been associated with anaphylactic reactions in patients with and without known hypersensitivity to flurbiprofen and in patients with aspirin-sensitive asthma [see Contraindications (4) and Warnings and Precautions (5.8)]. Seek emergency help if an anaphylactic reaction occurs. A subpopulation of patients with asthma may have aspirin-sensitive asthma which may include chronic rhinosinusitis complicated by nasal polyps; severe, potentially fatal bronchospasm; and/or intolerance to aspirin and other NSAIDs. Because cross-reactivity between aspirin and other NSAIDs has been reported in such aspirin-sensitive patients, flurbiprofen is contraindicated in patients with this form of aspirin sensitivity [see Contraindications (4)]. When flurbiprofen is used in patients with preexisting asthma (without known aspirin sensitivity), monitor patients for changes in the signs and symptoms of asthma. NSAIDs, including flurbiprofen, can cause serious skin adverse reactions such as exfoliative dermatitis, Stevens-Johnson Syndrome (SJS), and toxic epidermal necrolysis (TEN), which can be fatal. These serious events may occur without warning. Inform patients about the signs and symptoms of serious skin reactions, and to discontinue the use of flurbiprofen at the first appearance of skin rash or any other sign of hypersensitivity. Flurbiprofen is contraindicated in patients with previous serious skin reactions to NSAIDs [see Contraindications (4)]. Flurbiprofen may cause premature closure of the fetal ductus arteriosus. Avoid use of NSAIDs, including flurbiprofen, in pregnant women starting at 30 weeks of gestation (third trimester) [see Use in Specific Populations (8.1)]. Anemia has occurred in NSAID-treated patients. This may be due to occult or gross blood loss, fluid retention, or an incompletely described effect on erythropoiesis. If a patient treated with flurbiprofen has any signs or symptoms of anemia, monitor hemoglobin or hematocrit.NSAIDs, including flurbiprofen, may increase the risk of bleeding events. Co-morbid conditions such as coagulation disorders of concomitant use of warfarin, other anticoagulants, antiplatelet agents (e.g., aspirin), serotonin reuptake inhibitors (SSRIs), and serotonin norepinephrine reuptake inhibitors (SNRIs) may increase this risk. Monitor these patients for signs of bleeding [see Drug Interactions (7)]. The pharmacological activity of flurbiprofen in reducing inflammation, and possibly fever, may diminish the utility of diagnostic signs in detecting infections. Blurred and/or diminished vision has been reported with the use of flurbiprofen and other nonsteroidal anti-inflammatory drugs. Patients experiencing eye complaints should have ophthalmologic examinations. See Table 1 for clinically significant drug interactions with flurbiprofen.Table 1: Clinically Significant Drug Interactions with FlurbiprofenDrugs That Interfere with Hemostasis Clinical Impact: •Flurbiprofen and anticoagulants such as warfarin have a synergistic effect on bleeding. The concomitant use of flurbiprofen and anticoagulants have an increased risk of serious bleeding compared to the use of either drug alone. •Serotonin release by platelets plays an important role in hemostasis. Case-control and cohort epidemiological studies showed that concomitant use of drugs that interfere with serotonin reuptake and an NSAID may potentiate the risk of bleeding more than an NSAID alone.Intervention: Monitor patients with concomitant use of flurbiprofen with anticoagulants (e.g., warfarin), antiplatelet agents (e.g., aspirin), selective serotonin reuptake inhibitors (SSRIs), and serotonin norepinephrine reuptake inhibitors (SNRIs) for signs of bleeding [see Warnings and Precautions (5)]. Aspirin Clinical Impact: Controlled clinical studies showed that the concomitant use of NSAIDs and analgesic doses of aspirin does not produce any greater therapeutic effect than the use of NSAIDs alone. In a clinical study, the concomitant use of an NSAID and aspirin was associated with a significantly increased incidence of GI adverse reactions as compared to use of the NSAID alone [see Warnings and Precautions (5)]. Concurrent administration of aspirin lowers serum flurbiprofen concentrations. The clinical significance of this interaction is not known. Intervention: Concomitant use of flurbiprofen and analgesic doses of aspirin is not generally recommended because of the increased risk of bleeding [see Warnings and Precautions (5)]. Flurbiprofen is not a substitute for low dose aspirin for cardiovascular protection. ACE Inhibitors, Angiotensin Receptor Blockers, and Beta-Blockers Clinical Impact: •NSAIDs may diminish the antihypertensive effect of angiotensin converting enzyme (ACE) inhibitors, angiotensin receptor blockers (ARBs), or beta-blockers (including propranolol). •In patients who are elderly, volume-depleted (including those on diuretic therapy), or have renal impairment, coadministration of an NSAID with ACE inhibitors or ARBs may result in deterioration of renal function, including possible acute renal failure. These effects are usually reversible. Intervention: •During concomitant use of flurbiprofen and ACE-inhibitors, ARBs, or beta-blockers, monitor blood pressure to ensure that the desired blood pressure is obtained. •During concomitant use of flurbiprofen and ACE-inhibitors or ARBs in patients who are elderly, volume-depleted, or have impaired renal function, monitor for signs of worsening renal function [see Warnings and Precautions (5.6)]. •When drugs are administered concomitantly, patients should be adequately hydrated. Assess renal function at the beginning of the concomitant treatment and periodically thereafter. Diuretics Clinical Impact: Clinical studies, as well as post-marketing observations, showed that NSAIDs reduced the natriuretic effect of loop diuretics (e.g., furosemide) and thiazide diuretics in some patients. This effect has been attributed to the NSAID inhibition of renal prostaglandin synthesis. Intervention: During concomitant use of flurbiprofen with diuretics, observe patients for signs of worsening renal function, in addition to assuring diuretic efficacy including antihypertensive effects [see Warnings and Precautions (5)]. Digoxin Clinical Impact: The concomitant use of flurbiprofen with digoxin has been reported to increase the serum concentration and prolong the half-life of digoxin [see Clinical Pharmacology (12.3)]. Intervention: During concomitant use of flurbiprofen and digoxin, monitor serum digoxin levels. Lithium Clinical Impact: NSAIDs have produced elevations in plasma lithium levels and reductions in renal lithium clearance. The mean minimum lithium concentration increased 15%, and the renal clearance decreased by approximately 20%. This effect has been attributed to NSAID inhibition of renal prostaglandin synthesis. Intervention: During concomitant use of flurbiprofen and lithium, monitor patients for signs of lithium toxicity. Methotrexate Clinical Impact: Concomitant use of NSAIDs and methotrexate may increase the risk for methotrexate toxicity (e.g., neutropenia, thrombocytopenia, renal dysfunction). Intervention: During concomitant use of flurbiprofen and methotrexate, monitor patients for methotrexate toxicity. Cyclosporine Clinical Impact: Concomitant use of flurbiprofen and cyclosporine may increase cyclosporine’s nephrotoxicity. Intervention: During concomitant use of flurbiprofen and cyclosporine, monitor patients for signs of worsening renal function. NSAIDs and Salicylates Clinical Impact: Concomitant use of flurbiprofen with other NSAIDs or salicylates (e.g., diflunisal, salsalate) increases the risk of GI toxicity, with little or no increase in efficacy [see Warnings and Precautions (5.2)]. Intervention: The concomitant use of flurbiprofen with other NSAIDs or salicylates is not recommended. Pemetrexed Clinical Impact: Concomitant use of flurbiprofen and pemetrexed may increase the risk of pemetrexed-associated myelosuppression, renal, and GI toxicity (see the pemetrexed prescribing information). Intervention: During concomitant use of flurbiprofen and pemetrexed, in patients with renal impairment whose creatinine clearance ranges from 45 to 79 mL/min, monitor for myelosuppression, renal and GI toxicity. NSAIDs with short elimination half-lives (e.g., diclofenac, indomethacin) should be avoided for a period of two days before, the day of, and two days following administration of pemetrexed. In the absence of data regarding potential interaction between pemetrexed and NSAIDs with longer half-lives (e.g., meloxicam, nabumetone), patients taking these NSAIDs should interrupt dosing for at least five days before, the day of, and two days following pemetrexed administration. Corticosteroids Clinical Impact: Concomitant use of corticosteroids with flurbiprofen may increase the risk of GI ulceration or bleeding. Intervention: Monitor patients with concomitant use of flurbiprofen with corticosteroids for signs of bleeding [see Warnings and Precautions (5.2)]. Risk SummaryUse of NSAIDs, including flurbiprofen, during the third trimester of pregnancy increases the risk of premature closure of the fetal ductus arteriosus. Avoid use of NSAIDs, including flurbiprofen, in pregnant women starting at 30 weeks of gestation (third trimester). There are no adequate and well-controlled studies of flurbiprofen in pregnant women. Data from observational studies regarding potential embryo-fetal risks of NSAID use in women in the first or second trimesters of pregnancy are inconclusive. In the general U.S. population, all clinically recognized pregnancies, regardless of drug exposure, have a background rate of 2 to 4% for major malformations, and 15 to 20% for pregnancy loss. In animal reproduction studies, delayed parturition, prolonged labor, stillborn fetuses, and the presence of retained fetuses at necropsy occurred following treatment of pregnant rats treated with oral flurbiprofen throughout gestation until labor at less than 1-time the human dose of 300 mg/day. Embryofetal lethality was seen in pregnant rats and rabbits administered oral flurbiprofen during the period of organogenesis at exposures 0.03-times and 0.5 times, respectively, the human dose of 300 mg. No evidence of malformations were noted in rats, rabbits, or mice treated with flurbiprofen during the period of organogenesis at doses that were 0.8-, 0.5-, and 0.2-times the maximum human daily dose [see Data]. Based on animal data, prostaglandins have been shown to have an important role in endometrial vascular permeability, blastocyst implantation, and decidualization. In animal studies, administration of prostaglandin synthesis inhibitors such as flurbiprofen, resulted in increased pre- and post-implantation loss. Clinical ConsiderationsLabor or DeliveryThere are no studies on the effects of flurbiprofen during labor or delivery. In animal studies, NSAIDS, including flurbiprofen, inhibit prostaglandin synthesis, cause delayed parturition, and increase the incidence of stillbirth.DataAnimal dataPregnant rats were treated with oral doses of 0.05, 1, and 3 mg/kg flurbiprofen 14 days prior to mating through Gestation Day (GD) 16. Embryofetal lethality was seen at 1 mg/kg and above (0.03 times the maximum recommended human dose [MRHD] of 300 mg on a mg/m2 basis). No maternal toxicity was evident at this dose. No malformations were seen in fetuses from pregnant rats administered flurbiprofen during the period of organogenesis at doses up to 25 mg/kg (0.8 times the MRHD on a mg/m2 basis). Maternal toxicity (uterine hemorrhage, gastric ulcers) was observed at this dose. Pregnant rabbits were administered oral doses of 0.675, 2.25, and 7.5 mg/kg flurbiprofen from GD 1 through GD 29. Embryofetal lethality, but no evidence of teratogenicity, was seen at 7.5 mg/kg (0.5 times the MRHD of 300 mg on a mg/m2 basis). Maternal toxicity (gastric ulcers and lethality) was observed at this dose. Pregnant mice were treated with oral doses of 2, 5, and 12 mg/kg flurbiprofen from GD 3 to 18. An increased incidence of fetal lethality occurred in the 12 mg/kg group (0.2 times the MRHD). All doses were associated with some evidence of maternal toxicity (placental hemorrhage). Pregnant rats were treated with oral doses of 0.2, 0.675, 2.25, 7.5, and 25 mg/kg flurbiprofen from GD 1 until labor. Delayed delivery, the incidence of stillborn pups, and decreased pup viability, were noted at doses of 2.25 mg/kg and higher (0.07 times the MRHD). These doses were associated with maternal toxicity (uterine hemorrhage, gastrointestinal ulceration, decreased body weight). Pregnant rats treated with oral doses of 0.4, 4, and 10 mg/kg flurbiprofen from GD 16 to labor, delayed parturition was seen at 0.4 mg/kg and above and stillborn pups were seen at 4 mg/kg and above (0.01-times and 0.13 times, respectively, the MRHD on mg/m2 basis). Uterine hemorrhage, ulceration, and mortality were noted in dams at 0.4 mg/kg and above. Risk SummaryFlurbiprofen is poorly excreted into human milk. The nursing infant dose is predicted to be approximately 0.1 mg/day in the established milk of a woman taking flurbiprofen 200 mg/day. The developmental and health benefits of breastfeeding should be considered along with the mother’s clinical need for flurbiprofen and any potential adverse effects on the breastfed infant from flurbiprofen or from the underlying maternal condition. InfertilityFemalesBased on the mechanism of action, the use of prostaglandin-mediated NSAIDs, including flurbiprofen, may delay or prevent rupture of ovarian follicles, which has been associated with reversible infertility in some women. Published animal studies have shown that administration of prostaglandin synthesis inhibitors has the potential to disrupt prostaglandin-mediated follicular rupture required for ovulation. Small studies in women treated with NSAIDs have also shown a reversible delay in ovulation. Consider withdrawal of NSAIDs, including flurbiprofen, in women who have difficulties conceiving or who are undergoing investigation of infertility. Symptoms following acute NSAID overdosages have been typically limited to lethargy, drowsiness, nausea, vomiting, and epigastric pain, which are generally reversible with supportive care. Gastrointestinal bleeding has occurred. Hypertension, acute renal failure, respiratory depression and coma have occurred, but were rare [see Warnings and Precautions (5.1, 5.2, 5.4, 5.6)]. Manage patients with symptomatic and supportive care following an NSAID overdosage. There are no specific antidotes. Consider emesis and/or activated charcoal (60 to 100 grams in adults, 1 to 2 grams per kg of body weight in pediatric patients) and/or osmotic cathartic in symptomatic patients seen within four hours of ingestion or in patients with a large overdosage (5 to 10 times the recommended dosage). Forced diuresis, alkalinization of urine, hemodialysis, or hemoperfusion may not be useful due to high protein binding. For additional information about overdosage treatment contact a poison control center (1-800-222-1222). Flurbiprofen tablets USP are a member of the phenylalkanoic acid derivative group of nonsteroidal anti-inflammatory drug. 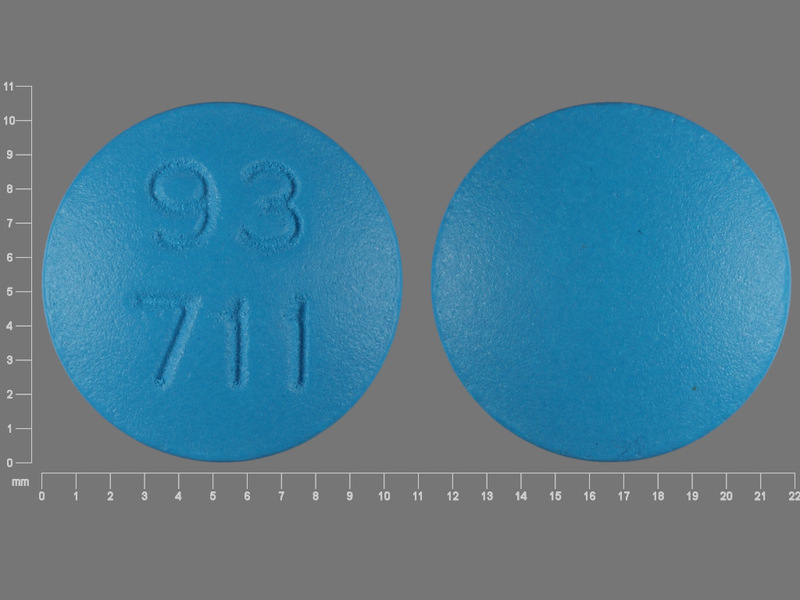 Flurbiprofen tablets USP are round, blue, film-coated debossed “93” – “711” tablets for oral administration. Flurbiprofen, USP is a racemic mixture of (+)S- and (-)R- enantiomers. Flurbiprofen, USP is a white or slightly yellow crystalline powder. It is slightly soluble in water at pH 7.0 and readily soluble in most polar solvents. 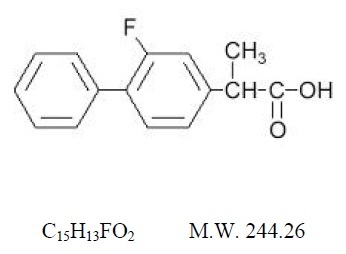 The chemical name is [1,1’-biphenyl]-4-acetic acid,2-fluoro-α-methyl-, (±)-. It has the following structural formula: Each tablet, for oral administration, contains 100 mg flurbiprofen, USP. In addition, each tablet contains the following inactive ingredients: colloidal silicon dioxide, croscarmellose sodium, hypromellose, lactose monohydrate, magnesium stearate, microcrystalline cellulose, polyethylene glycol, polysorbate 80, titanium dioxide, and FD&C Blue #1 aluminum lake. Flurbiprofen has analgesic, anti-inflammatory, and antipyretic properties. The mechanism of action of flurbiprofen, like that of other NSAIDs, is not completely understood but involves inhibition of cyclooxygenase (COX-1 and COX-2). Flurbiprofen is a potent inhibitor of prostaglandin (PG) synthesis in vitro. Flurbiprofen concentrations reached during therapy have produced in vivo effects. Prostaglandins sensitize afferent nerves and potentiate the action of bradykinin in inducing pain in animal models. Prostaglandins are mediators of inflammation. Because flurbiprofen is an inhibitor of prostaglandin synthesis, its mode of action may be due to a decrease of prostaglandins in peripheral tissues. General pharmacokinetic characteristicsThe pharmacokinetics of flurbiprofen have been characterized in healthy subjects, special populations and patients (see Table 2). The pharmacokinetics of flurbiprofen are linear, and there is little accumulation of flurbiprofen following multiple doses of flurbiprofen.Table 2: Mean (SD) R-,S-Flurbiprofen Pharmacokinetic Parameters Normalized to a 100 mg Dose of Flurbiprofen TabletsPharmacokinetic ParameterNormal Healthy Adults100 mg single-dose(18 to 40 years) N = 15Geriatric Arthritis PatientsSteady-state evaluation of 100 mg every 12 hours(65 to 83 years) N = 13End Stage Renal Disease Patients(23 to 42 years) N = 8Alcoholic Cirrhosis Patients200 mg single-dose(31 to 61 years) N = 8Peak Concentration (mcg/mL)14 (4)16 (5)9Calculated from mean parameter values of both flurbiprofen enantiomers9Time to Reach Peak Concentration (h)1.9 (1.5)2.2 (3)2.31.2Urinary Recovery of Unchanged Flurbiprofen (% of Dose)2.9 (1.3)0.6 (0.6)0.02 (0.02)NANot availableArea Under the Curve (AUC) (mcg•h/mL)AUC from 0 to infinity for single doses and from 0 to the end of the dosing interval for multiple-doses83 (20)77 (24)4450Apparent Volume of Distribution (Vz/F, L)14 (3)12 (5)1014Terminal Elimination Half-life (t½, h)7.5 (0.8)5.8 (1.9)3.3Value for S-flurbiprofen5.4AbsorptionThe mean oral bioavailability of flurbiprofen from flurbiprofen tablets 100 mg is 96% relative to an oral solution. Flurbiprofen is rapidly and non-stereoselectively absorbed from flurbiprofen, with peak plasma concentrations occurring at approximately 2 hours (see Table 2). Administration of flurbiprofen with either food or antacids may alter the rate but not the extent of flurbiprofen absorption. Ranitidine has been shown to have no effect on either the rate or extent of flurbiprofen absorption from flurbiprofen. DistributionThe apparent volume of distribution (Vz/F) of both R- and S-flurbiprofen is approximately 0.12 L/kg. Both flurbiprofen enantiomers are more than 99% bound to plasma proteins, primarily albumin. Plasma protein binding is relatively constant for the typical average steady-state concentrations (≤ 10 mcg/mL) achieved with recommended doses. Flurbiprofen is poorly excreted into human milk. The nursing infant dose is predicted to be approximately 0.1 mg/day in the established milk of a woman taking flurbiprofen 200 mg/day. MetabolismSeveral flurbiprofen metabolites have been identified in human plasma and urine. These metabolites include 4’-hydroxy-flurbiprofen, 3’, 4’-dihydroxy-flurbiprofen, 3’-hydroxy-4’-methoxy-flurbiprofen, their conjugates, and conjugated flurbiprofen. Unlike other arylpropionic acid derivatives (e.g., ibuprofen), metabolism of R-flurbiprofen to S-flurbiprofen is minimal. In vitro studies have demonstrated that cytochrome CYP2C9 plays an important role in the metabolism of flurbiprofen to its major metabolite 4’-hydroxy-flurbiprofen. The 4’-hydroxy-flurbiprofen metabolite showed little anti-inflammatory activity in animal models of inflammation. In vitro studies also demonstrated glucuronidation of both enantiomers of flurbiprofen and 4’-hydroxy-flurbiprofen. UGT2B7 is the predominant UGT isozyme responsible for the glucuronidation. Flurbiprofen does not induce enzymes that alter its metabolism. ExcretionFollowing dosing with flurbiprofen, less than 3% of flurbiprofen is excreted unchanged in the urine, with about 70% of the dose eliminated in the urine as flurbiprofen, 4’-hydroxy-flurbiprofen, and their acylglucuronide conjugates. Because renal elimination is a significant pathway of elimination of flurbiprofen metabolites, dosing adjustment in patients with moderate or severe renal dysfunction may be necessary to avoid accumulation of flurbiprofen metabolites. The mean terminal elimination half-lives (t½) of R- and S-flurbiprofen are similar, about 4.7 and 5.7 hours, respectively. Specific PopulationsPediatric: The pharmacokinetics of flurbiprofen have not been investigated in pediatric patients. Race: No pharmacokinetic differences due to race have been identified. Geriatric: Flurbiprofen pharmacokinetics were similar in geriatric arthritis patients, younger arthritis patients, and young healthy volunteers receiving flurbiprofen 100 mg as either single or multiple doses.Hepatic Impairment: Hepatic metabolism may account for > 90% of flurbiprofen elimination, so patients with hepatic disease may require reduced doses of flurbiprofen compared to patients with normal hepatic function. The pharmacokinetics of R- and S-flurbiprofen were similar, however, in alcoholic cirrhosis patients (N = 8) and young healthy volunteers (N = 8) following administration of a single 200 mg dose of flurbiprofen. Flurbiprofen plasma protein binding may be decreased in patients with liver disease and serum albumin concentrations below 3.1 g/dL. Renal Impairment: Renal clearance is an important route of elimination for flurbiprofen metabolites, but a minor route of elimination for unchanged flurbiprofen (≤ 3% of total clearance). The unbound clearances of R- and S-flurbiprofen did not differ significantly between normal healthy volunteers (N = 6, 50 mg single dose) and patients with renal impairment (N = 8, inulin clearances ranging from 11 to 43 mL/min, 50 mg multiple doses). Flurbiprofen plasma protein binding may be decreased in patients with renal impairment and serum albumin concentrations below 3.9 g/dL. Elimination of flurbiprofen metabolites may be reduced in patients with renal impairment. Flurbiprofen is not significantly removed from the blood into dialysate in patients undergoing continuous ambulatory peritoneal dialysis. Drug Interaction StudiesAntacids:Administration of flurbiprofen to volunteers under fasting conditions or with antacid suspension yielded similar serum flurbiprofen-time profiles in young adult subjects (n = 12). In geriatric subjects (n = 7), there was a reduction in the rate but not the extent of flurbiprofen absorption. Aspirin:Concurrent administration of flurbiprofen and aspirin resulted in 50% lower serum flurbiprofen concentrations. This effect of aspirin (which is also seen with other NSAIDs) has been demonstrated in patients with rheumatoid arthritis (n = 15) and in healthy volunteers (n = 16) [see Drug Interactions (7)]. Beta-adrenergic Blocking Agents:The effect of flurbiprofen on blood pressure response to propranolol and atenolol was evaluated in men with mild uncomplicated hypertension (n = 10). Flurbiprofen pretreatment attenuated the hypotensive effect of a single dose of propranolol but not atenolol. Flurbiprofen did not appear to affect the beta-blocker-mediated reduction in heart rate. Flurbiprofen did not affect the pharmacokinetic profile of either drug [see Drug Interactions (7)]. Cimetidine, Ranitidine:In normal volunteers (n = 9), pretreatment with cimetidine or ranitidine did not affect flurbiprofen pharmacokinetics, except for a small (13%) but statistically significant increase in the area under the serum concentration curve of flurbiprofen in subjects who received cimetidine. Digoxin:In studies of healthy males (n = 14), concomitant administration of flurbiprofen and digoxin did not change the steady state serum levels of either drug [see Drug Interactions (7)]. Diuretics:Studies in healthy volunteers have shown that, like other NSAIDs, flurbiprofen can interfere with the effects of furosemide. Although results have varied from study to study, effects have been shown on furosemide-stimulated diuresis, natriuresis, and kaliuresis [see Drug Interactions (7)]. Lithium:In a study of 11 women with bipolar disorder receiving lithium carbonate at a dosage of 600 to 1200 mg/day, administration of 100 mg flurbiprofen every 12 hours increased plasma lithium concentrations by 19%. Four of 11 patients experienced a clinically important increase (> 25% or > 0.2 mmol/L) [see Drug Interactions (7)]. Methotrexate:In a study of six adult arthritis patients, coadministration of methotrexate (10 to 25 mg/dose) and flurbiprofen (300 mg/day) resulted in no observable interaction between these two drugs [see Drug Interactions (7)].Oral Hypoglycemic Agents:In a clinical study, flurbiprofen was administered to adult diabetics who were already receiving glyburide (n = 4), metformin (n = 2), chlorpropamide with phenformin (n=3), or glyburide with phenformin (n = 6). Although there was a slight reduction in blood sugar concentrations during concomitant administration of flurbiprofen and hypoglycemic agents, there were no signs or symptoms of hypoglycemia. Poor Metabolizers of CYP2C9 Substrates:In patients who are known or suspected to be poor CYP2C9 metabolizers based on genotype or previous history/experience with other CYP2C9 substrates (such as warfarin and phenytoin), reduce the dose of flurbiprofen to avoid abnormally high plasma levels due to reduced metabolic clearance. CarcinogenesisFlurbiprofen was not carcinogenic in long-term studies in Fischer-344 and CD rats at doses up to 5 mg/kg/day and in CFLP mice at doses up to 12 mg/kg/day (0.16-times and 0.19-times, respectively, the human dose of 300 mg/day on a mg/m2 basis). MutagenesisFlurbiprofen was not genotoxic in an in vivo micronucleus assay in rats. Impairment of FertilityNo effect on male or female fertility in rats was observed after oral administration of 3 mg/kg flurbiprofen for 65 days prior to mating in males and 14 days prior to mating through Gestation Day 16 in females (equivalent to 0.1-times the human dose of 300 mg/day on a mg/m2 basis). This dose was not associated with significant toxicity in the dams or sires. Flurbiprofen tablets USP, 100 mg are round, blue, film-coated tablets debossed “93”-“711” available in;Bottles of 30 (NDC 68788-7341-3) Bottles of 60 (NDC 68788-7341-6) Bottles of 90 (NDC 68788-7341-9) Bottles of 100 (NDC 68788-7341-1) Store at 20° to 25°C (68° to 77°F) [See USP Controlled Room Temperature].Dispense in a tight, light-resistant container as defined in the USP, with a child-resistant closure (as required). Advise the patient to read the FDA-approved patient labeling (Medication Guide) that accompanies each prescription dispensed. Inform patients, families, or their caregivers of the following information before initiating therapy with flurbiprofen and periodically during the course of ongoing therapy. Cardiovascular Thrombotic EventsAdvise patients to be alert for the symptoms of cardiovascular thrombotic events, including chest pain, shortness of breath, weakness, or slurring of speech, and to report any of these symptoms to their health care provider immediately [see Warnings and Precautions (5)]. Gastrointestinal Bleeding, Ulceration, and PerforationAdvise patients to report symptoms of ulcerations and bleeding, including epigastric pain, dyspepsia, melena, and hematemesis to their health care provider. In the setting of concomitant use of low-dose aspirin for cardiac prophylaxis, inform patients of the increased risk for and the signs and symptoms of GI bleeding [see Warnings and Precautions (5)]. Hepatotoxicity Inform patients of the warning signs and symptoms of hepatotoxicity (e.g., nausea, fatigue, lethargy, pruritus, diarrhea, jaundice, right upper quadrant tenderness, and “flu-like” symptoms). If these occur, instruct patients to stop flurbiprofen and seek immediate medical therapy [see Warnings and Precautions (5)]. Heart Failure and EdemaAdvise patients to be alert for the symptoms of congestive heart failure including shortness of breath, unexplained weight gain, or edema and to contact their healthcare provider if such symptoms occur [see Warnings and Precautions (5)]. Anaphylactic ReactionsInform patients of the signs of an anaphylactic reaction (e.g., difficulty breathing, swelling of the face or throat). Instruct patients to seek immediate emergency help if these occur [see Contraindications (4) and Warnings and Precautions (5)]. Serious Skin ReactionsAdvise patients to stop flurbiprofen immediately if they develop any type of rash and to contact their healthcare provider as soon as possible [see Warnings and Precautions (5)]. Female FertilityAdvise females of reproductive potential who desire pregnancy that NSAIDs, including flurbiprofen, may be associated with a reversible delay in ovulation [see Use in Specific Populations (8.3)]. Fetal ToxicityInform pregnant women to avoid use of flurbiprofen and other NSAIDs starting at 30 weeks gestation because of the risk of the premature closing of the fetal ductus arteriosus [see Warnings and Precautions (5) and Use in Specific Populations (8)]. Avoid Concomitant Use of NSAIDsInform patients that the concomitant use of flurbiprofen with other NSAIDs or salicylates (e.g., diflunisal, salsalate) is not recommended due to the increased risk of gastrointestinal toxicity, and little or no increase in efficacy [see Warnings and Precautions (5) and Drug Interactions (7)]. Alert patients that NSAIDs may be present in “over the counter” medications for treatment of colds, fever, or insomnia. Use of NSAIDS and Low-Dose AspirinInform patients not to use low-dose aspirin concomitantly with flurbiprofen until they talk to their healthcare provider [see Drug Interactions (7)].Manufactured In India By:PIRAMAL ENTERPRISES LIMITEDPithampur, Madhya Pradesh, IndiaManufactured For:TEVA PHARMACEUTICALS USA, INC.North Wales, PA 19454Rev. K 5/2016Repackaged By: Preferred Pharmaceuticals Inc. Medication Guide for Nonsteroidal Anti-inflammatory Drugs (NSAIDs).What is the most important information I should know about medicines called Nonsteroidal Anti-inflammatory Drugs (NSAIDs)? NSAIDs can cause serious side effects, including: •Increased risk of a heart attack or stroke that can lead to death. This risk may happen early in treatment and may increase: •with increasing doses of NSAIDs •with longer use of NSAIDs Do not take NSAIDs right before or after a heart surgery called a “coronary artery bypass graft (CABG).” Avoid taking NSAIDs after a recent heart attack, unless your healthcare provider tells you to. You may have an increased risk of another heart attack if you take NSAIDs after a recent heart attack. •Increased risk of bleeding, ulcers, and tears (perforation) of the esophagus (tube leading from the mouth to the stomach), stomach and intestines: •anytime during use •without warning symptoms •that may cause death The risk of getting an ulcer or bleeding increases with: •past history of stomach ulcers, or stomach or intestinal bleeding with use of NSAIDs •taking medicines called “corticosteroids”, “anticoagulants”, “SSRIs” or “SNRIs” •increasing doses of NSAIDs •longer use of NSAIDs •smoking •drinking alcohol •older age •poor health •advanced liver disease •bleeding problems NSAIDs should only be used: •exactly as prescribed •at the lowest dose possible for your treatment •for the shortest time neededWhat are NSAIDs? NSAIDs are used to treat pain and redness, swelling, and heat (inflammation) from medical conditions such as different types of arthritis, menstrual cramps, and other types of short-term pain. Who should not take NSAIDs? Do not take NSAIDs: •if you have had an asthma attack, hives, or other allergic reaction with aspirin or any other NSAIDs. •right before or after heart bypass surgery. Before taking NSAIDs, tell your healthcare provider about all of your medical conditions, including if you: •have liver or kidney problems •have high blood pressure •have asthma •are pregnant or plan to become pregnant. Talk to your healthcare provider if you are considering taking NSAIDs during pregnancy. You should not take NSAIDs after 29 weeks of pregnancy. •are breastfeeding or plan to breast feed. Tell your healthcare provider about all of the medicines you take, including prescription or over-the-counter medicines, vitamins or herbal supplements. NSAIDs and some other medicines can interact with each other and cause serious side effects. Do not start taking any new medicine without talking to your healthcare provider first. What are the possible side effects of NSAIDs? NSAIDs can cause serious side effects, including: See “What is the most important information I should know about medicines called Nonsteroidal Anti-inflammatory Drugs (NSAIDs)? •new or worse high blood pressure •heart failure •liver problems including liver failure •kidney problems including kidney failure •low red blood cells (anemia) •life-threatening skin reactions •life-threatening allergic reactions •Other side effects of NSAIDs include: stomach pain, constipation, diarrhea, gas, heartburn, nausea, vomiting, and dizziness. Get emergency help right away if you get any of the following symptoms: •shortness of breath or trouble breathing •chest pain •weakness in one part or side of your body •slurred speech •swelling of the face or throatStop taking your NSAID and call your healthcare provider right away if you get any of the following symptoms: •nausea •more tired or weaker than usual •diarrhea •itching •your skin or eyes look yellow •indigestion or stomach pain •flu-like symptoms •vomit blood •there is blood in your bowel movement or it is black and sticky like tar •unusual weight gain •skin rash or blisters with fever •swelling of the arms, legs, hands and feetIf you take too much of your NSAID, call your healthcare provider or get medical help right away. These are not all the possible side effects of NSAIDs. For more information, ask your healthcare provider or pharmacist about NSAIDs. Call your doctor for medical advice about side effects. You may report side effects to FDA at 1-800-FDA-1088. Other information about NSAIDs •Aspirin is an NSAID but it does not increase the chance of a heart attack. Aspirin can cause bleeding in the brain, stomach, and intestines. Aspirin can also cause ulcers in the stomach and intestines. •Some NSAIDs are sold in lower doses without a prescription (over-the-counter). Talk to your healthcare provider before using over-the-counter NSAIDs for more than 10 days.General information about the safe and effective use of NSAIDs Medicines are sometimes prescribed for purposes other than those listed in a Medication Guide. Do not use NSAIDs for a condition for which it was not prescribed. Do not give NSAIDs to other people, even if they have the same symptoms that you have. It may harm them. If you would like more information about NSAIDs, talk with your healthcare provider. You can ask your pharmacist or healthcare provider for information about NSAIDs that is written for health professionals.This Medication Guide has been approved by the U.S. Food and Drug Administration.Revised May 2016Repackaged By: Preferred Pharmaceuticals Inc.